In recent times we have separated from our natural environment and this has deeply impacted our life styles and the way we grow, distribute and consume food. We have evolved from the outdoors into the confined controlled climate of the indoors. Now there is a growing desire among many to reconnect with Mother Earth and grow our own food. We know we have been missing something important that defines us as humans. To begin reconnecting to our roots, we must cultivate a certain degree of awareness as an introduction. The learning process takes time as we readjust our lifestyles and connect back with our original natural environment and get in touch with the food chi (Living food Energy). 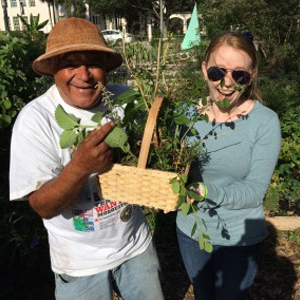 Get Connected – with an Organic Gardening Class! Developing & Maintaining community gardens at wellness centers/hospitals/churches/schools/community centers, etc. You understand and agree that by confirming/acknowledging to attend our classes you are doing so at your own risk/will, and that you waiver and release the underwriter and fascilitator of the class (Antonio Dagher) and class host (property owner) of whatsoever liabilities/claims of liabilities involving: personal physical body, material property loss, bodily injuries, accidents. Whether physical/mental/material property to your person individual-or company. Upon RSVP you pledge to release us/waiver all kinds of personal liabilities of loss or injuries in association with taking our classes and that you understand the risks and exposures to indoor/outdoor garden environment. We reserve our right to deny RSVP at our own discretion. Classes are subject to changes/cancellation without prior notification. No pets allowed. No unattended children allowed. No smoking. No alcohol. No Profanity, explicit language or inappropriate dress. Respect all people, plants and animals, be considerate of others and do not disturb class by any means. To attend a class you must RSVP, either by calling the phone number located on the invitation or emailing guerreroantonio16@gmail.com. If you sre emailing, please include your full name, phone number and a brief description about yourself such as background, gardening experience, education and what are you expecting to get out of the class. Classes are by RSVP only. Adults: $30 per person in advance / $40 at the door / Children under 12 FREE. Garden gear recommended: hats, shoes, long pants (no flip flops/tank tops or shorts). Bring along a bottle of potable water, a writing pad & pen, business cards, any gardening-related questions. Use the restroom before class. Take responsibility and attend to underage children. Lock your car. Leave valuables at home.